Watto wrote: Solution to my query from another thread regarding best action cam is here - arrived at this on my clever ownsome last week. Most good ski videos provide multiple perspectives such as bow back / cam on pole forward / helmet perspective etc. And hey that involves at least two cameras. Purchased a Hero 4 Silver GoPro the other day before a special offer ran out, saving now for the Garmin VIRB X which is due to be released US summer. Watto, I picked up a Virb Basic from Harvey Norman for $98 this week on clearance. Taking it for a spin later this week. I'm going to wait for prices to drop on the Virb X later in the year. The 3 min Wave Wow! Is my Friends why the Surf Ski was built Looking Good. I'll get my A into G and rig mine up mate and post some footage when we get a blow. Had the GoPro awhile now but haven't set it up - weather pretty average (no wind), though did have a big blow recently, stormy messy. Outstanding value at $98, mine x 4! It's still winter in the southern hemisphere but we're still doing it down in Hobart. Snow on Mount Wellington above the city and the water is cold. Yesterday I found a new solution to syncing my gps track with my video footage. Capsizing! Can't think why nobody hasn't thought of it before. Last edit: 3 years 7 months ago by Punches. Putting the V7s through their paces for the first time. Last edit: 3 years 7 months ago by Spacehopper. That's some great footage and editing. the image is so clear, how do you do it? Well done! Partly I think it's using the 100fps mode on the GoPro. Then it's a bit of playing in some editing software (Sony Movie Studio 12) afterwards. The stuff that comes out of a GoPro is usually has fairly washed out colours and is a bit soft so I tweak the contrast and the colours a bit and then sharpen the video. You have to be careful with the sharpening as it can end up producing lots of noticeable artifacts on the video - if you look closely along the top of my arms and shoulders there's an obvious light strip between them and the sky, if I pushed it any further it would probably get worse end up looking rubbish! Possibly related to the recent thread on the new Ocean skis? Last edit: 3 years 6 months ago by Lance. 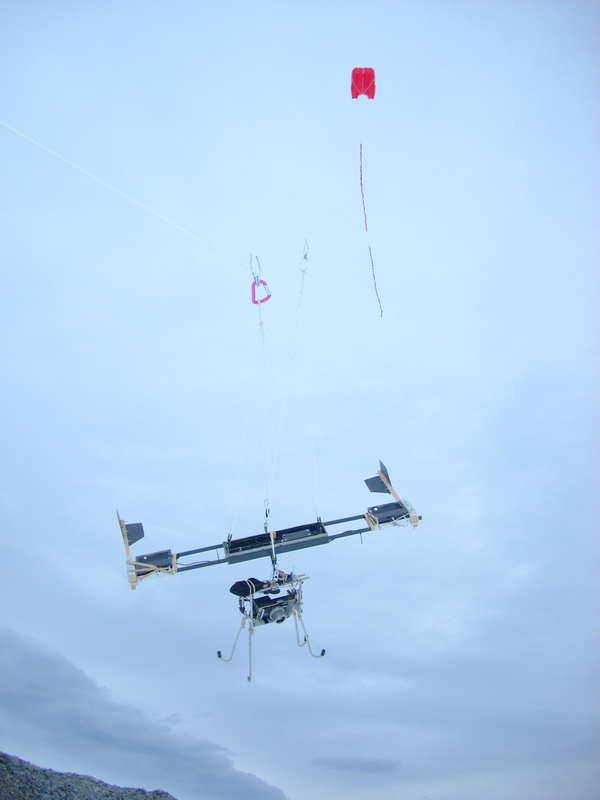 Has anyone heard of KAP or Kite Aerial Photography and considered using it to film some downwind action from their ski? I saw an article in our local paper about a guy experimenting with it for aerial photography in high winds in Antarctica and I've often thought that could be a great perspective to capture. It seems there are lots of off the shelf camera platforms available and a small, single line parafoil kite might be a good starting point. I wonder how you might attach it to your craft so that you can retrieve it if necessary and paddle without getting caught in the line? Interesting thought although I think the tugging from the kite would be very distracting & it may experience flight difficulties as the wind it'd see would be reduced by ski's downwind speed. However I know multi-lined controllable kites have been used very effectively to sail kayaks i.e. kind of like sit down kite surfing! 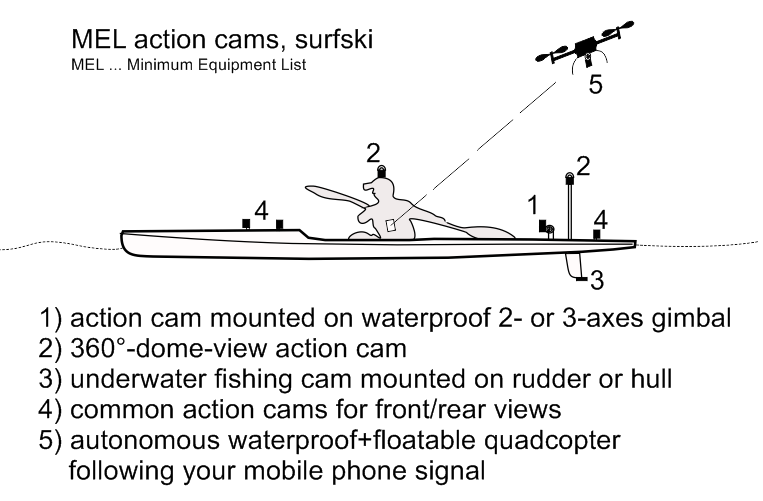 actually ... (non-drone) waterproof gimbals will be availabe 2016, I really like how gimbals help to capture the dynamics of surfski paddling (or SUP), esp. when mounted on the stern & showing the paddler from behind ... or using a 360°-dome-view action cam on such a thing ... would I do that? no, but would surely enjoy watching such clips when done with the Mockes/Rices/etc. Last edit: 3 years 5 months ago by Uffilation. I've been trying out a new video camera - I'm impressed! Mast: Custom made & rear mounted directly above the rudder, lens 850mm above deck. Heart Rate: Garmin Flexible deluxe strap - Always have dramas with it by 3/4 the way through a paddle. Me: approaching mid 50's, No: Balance, Technique, Fittness or Rotation but still having the time of my life - most days! Last edit: 3 years 4 months ago by Simon Haywood. That's a great view, Simon, and great conditions. Takes fitness to keep climbing over the backs of waves like you were doing! The camera has great color rendition and good sound, too. That tapping might be something loose in the mount. I was getting that same sound on videos from my DIY GoPro mount down at the base of the tripod, and tightening everything up made the tapping go away. Last edit: 3 years 4 months ago by David Grainger. David, The tapping is not in the mast or mount unfortunately - It was there before i installed the camera gear...The rudder shaft has some slop between the tube and shaft (i get feed back through the pedals)...It wasn't as noticeable with the other cameras as their microphone were not as good as this camera...But I think the wind and wave sounds add to the video for realism I'll get some delrin sleeves fabricated to take out the slop in the shaft. If you go to my vimeo channel and compare the footage the film shot on the 4th December was shot using the same camera but mounted (12inches or 300mm) lower - yet there is a quite difference. I occassionaly land where there are waves...The mast will either snap(very unlikely it's Stainless Steel) or brake my very nice ski (more likely) so height is an issue. the same to for adding weight out to either side...I need all the help with my balance. the other thing to consider is the lens these cameras use, effects the vision - just as too low to the deck flattens the waves too high will do the same - Its all a compromise. ideally i'd like a chase boat to follow me with drone thrown in - alas it's out of my reach! Video of the Week - Sharon Armstrong... Again! © 2010 - 2019 surfski.info. All Rights Reserved.